This research paper outlines that the success that Apple Inc. enjoys is based on the approach based on strengths that Steve Jobs cultivated in the organization as a company strategy during his tenure as the Chief Executive Officer of the corporation. This approach to knowledge management is basically built on the creation of deviant performance with a positive outlook, which ultimately results in the achievement of runaway success in the company that exceeds the expectations of both stakeholders and the projections of competitors. The company approach to knowledge management for sustainable development is based on key pillars of focusing on exploiting the major capabilities of employee at the workplace, taking advantage of available opportunities to utilize employee strengths through innovation, and cultivating an organizational culture that ensures the perpetuation of these practices over time. Ultimately, Apple Inc. has been able to create a result-oriented workforce with continuously learning at its core. Strategic planning for sustainable development in an organizational context basically involves identification of the problem at hand, analysis of its causative factors, proposing viable solutions to the problem and finally coming up with a set of options to mitigate the problem. However, although many organizations can successfully adopt this strategy, it does not result in maximal knowledge management as well as optimal utilization of social capital in a sustainable manner(Handzic 2004). Sustainable knowledge management which is reflected in positive deviant performance is achieved only when the organization is functionally efficient to at the highest level possible, as well as realizing the best performance. Therefore, an approach to strategy based on organizational strength must be adopted for this objective to be achieved. This does not mean that the organization ignores the environmental threats it faces at the expense of exploiting its strengths, but resources are channeled into the social capital of the organization in order to align it to the most achievable objectives of the organization in order to generate and sustain maximum performance(Handzic 2004). To sustain maximal performance backed by strategic planning, leaders adopt unique approaches that are aligned to their objective of value creation, which make the process of attainment of extraordinary success possible. Apple Inc. is a good example of a company that has managed to formulate a strategy based on strength that has the capacity to sustain extraordinary performance in the long term(Müller 2011). Upon Steve Jobs’ return to Apple Inc. in the year 2000, the company was worth $5billion. However, just 10 years later its worth has skyrocketed to the tune of at least $165billion. Nevertheless, the success of Apple Inc. has not been reflected in a strong financial position only. Even though the company may enjoy less than 10% of the personal computer share of the market in the United States, it has at least a 12% share in the smart phone market on the global scale, as well as a dominant share of the market for other products such as the MP3player. The company has also consistently won back to back accolades for management, marketing and innovation consistently(Müller 2011). In this research, the position that Steve Job’s strategy of utilizing a generative recipe of approaches to define the process of strategic planning at Apple Inc. during his tenure as the C.E.O has placed the company on a path of sustainable knowledge management, which is the backbone of its success. His approach entailed the framing of the strategy of Apple through conceptualizing its story, creating a strategy based on exploitation of opportunities and defining the core capabilities of the company that distinguish it from other competitors in the industry. Furthermore, this research examines the position of organizational culture in the overall strategy of Apple Inc of maintaining optimal performance through promoting continuous learning in the organization. 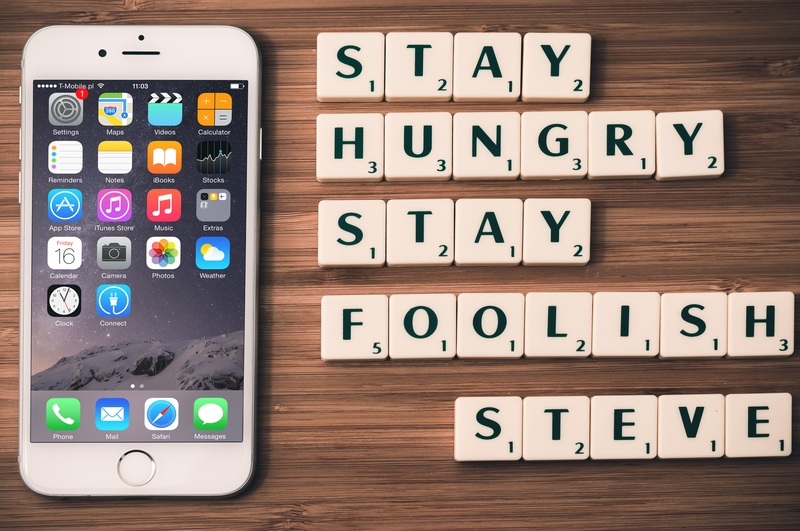 When Steve Jobs was in charge at Apple Inc., he was lauded for his ability to conceptualize the strategy of the company through coming up with a story line which people could identify with. This was through the crafting of a convincing, chronologically ordered story that reflected the specific mission of the company and promoted value proposition as the primary themes of the core strategy of Apple Inc. As an example, the Annual Report of the company in 2009 outlined its strategy as “Bringing the best personal computing, mobile communication, and portable digital music and video experience to consumers[…].”(O’Grady 2009, pg.34). Although it can be argued that any other companies within the same industry could have easily outlined the same strategy as Apple, it must be noted that Jobs and the top leadership at Apple did not stop at this point but went ahead to breathe life into this strategy through the adoption of storylines that utilized rhetoric, images and metaphors to back it up. As a case in point, this storyline has been reflected in the adoption of marketing offensives such as the “Think Different” advertisements series, which gave Apple a unique appeal that distinguished it from its competitors and stole the limelight through appearing cool and trendy. These advertisements were backed with sound bites proclaiming that “[…] because the people who are crazy enough to think they can change the world are the ones who do”(O’Grady 2009, pg.47). Renowned figures chosen by Apple as the face of this marketing offensive were historical figures and personalities best remembered for challenging the status quo and injecting fresh perspectives into the normal train of thinking such as President Jimmy Carter, a Nobel laureate, and Rosa Parks, an icon of the American Civil Rights Movement. Through choosing such figures to be the face of the company’s marketing campaign, Apple Inc. was able to appeal to the public through enabling them to understand its strategy by identifying it with obvious social identities(Mishra 2009). However, Jobs did not just use the stories for marketing purposes, but conceptualized them to inform the employees at the company of the aim of its core strategy to beat its competition through adopting an approach of futuristic and insightful visualization of its innovativeness. The story line created by Steve Jobs therefore defined the core strategy of the company. In example, back in 1981 Steve Jobs story involved the portrayal of the company as an entity with a firm commitment to unveiling simple enough computers for the ordinary customer(Linzmayer 2004). 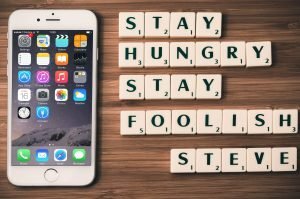 During this early period, Steve Jobs prophesied that the computer would change the lifestyle of man just like the motor vehicle and the telephone had. Jobs simply outlined his mission as to have an Apple computer on all available desks. However, just as it was characteristic of his style of leadership, Steve Jobs started his campaign from within the company. He issued a memo banning the purchase and availing of typewriters within the company premises. He outlined that since Apple Inc. was marketing itself as an innovation-driven entity, the company staff and stakeholders had to internalize this belief and set a precedence in line with it. He specifically outlined since in their innovativeness typewriters were obsolete in view of computers, they had to purge them from the company premises before expecting customers to believe in word processing computers. In time, Jobs had conceptualized Apple’s story to encapsulate a rivalry between it and IBM, the leading computer company at the time, such that users would identify with Apple’s products. IBM was the villain and to motivate the staff at the company, Jobs communicated to them that IBM wanted to dominate the market and Apple was the company that was going to stop it. In the annual report of 1984, Jobs painted the picture of a Goliath vs David competition between IBM and Apple in order to motivate the MAC clients to shun IBM products. He aimed to tipping the market share to Apple’s products that users could identify with as opposed to the bland computers that IBM was offering. Later on, Job shifted his strategy to attack Microsoft(Linzmayer 2004). Therefore, through strategic stories, the employees in an organization are able to discover their capacity to make a positive impact on the future of the company through deciphering the identity of the organization through the distinct conceptualization of its objective. In addition, strategic stories lay out the purpose and aims of a particular road map the company intends to follow(Becerra-fernandez and Sabherwal 2010). We hope that our Steve Jobs essay will encourage you to write your own paper. It is presented as a sample of an essay for the IT subject. If writing process is really difficult for you, you should leave your paper to BuyEssay.org. Our writers have writing skills and experience to complete a strong Steve Job essay or any other type of paper for you. Why should you struggle with your writing assignment if there is a writing service ready to write your paper for you at the reasonable price? We work 24/7 for our customers’ convenience. Tell us what paper you want to receive and we will do everything possible to satisfy your needs in academic writing.